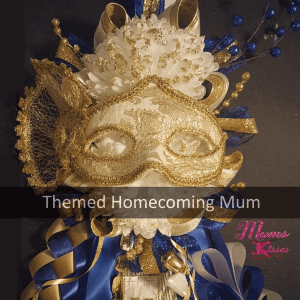 Here it is, 25 Hottest Trends For The Best Homecoming Mums of 2018. What’s New, What’s Old, What’s Hot & What’s Not. Opinions from the kids who wear ’em! Are you ready? Every year we publish our list of 25 hottest Trends for the best homecomings mums. This year we have some cool new trends for you, we can’t wait to share! Before we begin, let’s remember how far we’ve come! Homecoming Mums and Garters used to be a real flower with some tulle and a pin. Now we have these Texas Sized Homecoming Mums like only Texans can do! All photos and quotes are used with permission from their originating sources. 25. Not Hot – Mum Size Restrictions. Last year this made Mums size restrictions made the list, but this year it’s even MORE important! In the past mums were done by grade. Example: Freshman got a single, sophomore got a double etc. Now size is more of a matter of preference. We agree with you Jessie, and thanks for letting us use your quote! There shouldn’t be constrictions on size according to grade. Wear what you wanna wear! The saying that “Everything is Bigger in Texas” is true even with mums! In 2017 we saw some MASSIVE designs. In 2018 look for even more megas especially the mega single mums and mega hearts to take over! The mega mums have been around for years but their popularity is growing quickly! Their size allows for more customizations, more braids, literally more of everything. And don’t think it’s just a Texas thing, girls in Oklahoma are going bigger every year too. We’ve seen a massive increase in demand for 8″ and larger mums from New Mexico to Georgia in 2018! 23. What’s Hot – Bling! Bling and More Bling! We’re keeping bling on the list at number 23 for two years running, Bling is still very hot! Since 2016 bling has been the “it” thing. In 2018 we still just can’t get enough of the bling, rhinestones, sequin and even Swarovski Crystal, are all the rage. BUT, there’s a new twist! Not all bling is considered equal, Bling in the braids, bling in the letters and bling on the deco bells is the super hot trend in 2018. Strategically placed bling is hot but be careful. Bling on plastic trinkets CAN go wrong if done incorrectly. You can’t have enough bling but you can have too much misplaced bling. 22. Not Hot – Teddy Bears So Big We Can’t See The Flower. In 2017 Teddy bears were on the “what’s old” list, this year, the students say they’re not quite old yet but they’re not so hot IF, the bear is so big they can’t see the mum flower at all. “I’m not big on bears, we’re teens not 5 year olds. I ordered a mum. not a bear!” – Philla Creason, Senior Westlake High. Philla isn’t the only one. The demand for huge bears are getting less and less. And those that want bears are asking for the smaller versions. Because they’re cheaper and because they literally can’t see the mum flower with the bear in the way. This is new to the list in 2018. Monograms are taking over as the centerpiece for mums. Most are initials some are school initials, the choice is up to you. Specialty names and words are gaining popularity as they are not found in craft stores except as stickers and custom mum makers are one of the only places you’ll find them. They’re your words like “Senior” in script lettering, or your name in 3D. They’ve been around a while but are making a good solid stand in 2018. It’s those details that make the mum really stand out. 20. What’s Hot – LOTS of Braids! Braids have been on our list for about 2 years but have moved up in rank. They are the difference between a flat mum and a mum that has depth. There is a lot of new braids out! BUT… the craft stores won’t sell them. Yet another reason to order from a custom mum maker. The standard braids are usually the military braid, loops and a diamondback. You’ve seen them at the craft stores. $10 for a long skinny braid. In 2018 the braids have that bling factor and are a LOT more creative. Like the above photo, the mums of 2018 are thicker and fuller and they are made of real satin! In years past the mums were a few ribbon strands and made of that paper floral ribbon. Although weather proof, they weren’t the keep sake they are now. The thicker they are the more customizations you can have too! Caution though – the thicker they are, the HEAVIER they become to wear, Which brings us to numer 18.
the neck straps even for some double mums. The thick and full trend makes for a heavy mum and the neck strap a must have! They’re more comfortable to wear and easier to hang up as well. In 2017 we saw a major shift in the LED lights. Not only did they come off of the “What’s Old” list, BUT they’re back! In 2018 the lights are different than they have been in past years, their sometimes blinky, but mostly they are fairy like. A sort of soft light. That glows just enough to enhance the elegance of the mum. We are so excited to have the LED lights back in! Keep it Lit! 16. What’s Hot – Alternative Centerpieces! This year, the Homecoming Mums of 2018 Teddy bears and trinkets aren’t the only thing that a mum centerpiece can be. And in 2018 it’s hot to wear your initial or monogram or your school’s initials as a mum centerpiece! This trend has gotten hotter every year! More and more students are turning away from the teddy bear and onto alternative centerpieces. Sports themed, giant musical notes and mascot heads have come to light to take the coveted place of the bear. In 2016 we saw more of these than anything else and the hotness continues into 2018! Ever wonder how they get those cool ribbons that say “National Honors Society Diva” or “I’m a 4.0” or “Daddy’s Little Girl”? Those are the Brag Ribbons put inside the mum design that are custom made. There are only very few mum makers that have these as mum creators, Mums and Kisses is the first to offer it, and it has spread. 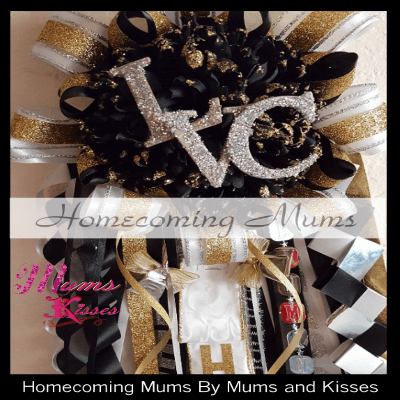 Its one more thing we’re loving for Homecoming Mums 2018! They jingle, they make noise and they annoy the heck out of the teachers! What more can you ask for?! Make ’em noisy! You don’t have to use a heavy cowbell to do it either, try a bunch of little bells that jingle all over the place when you walk. That’s cool! Apologies to to the teachers in advance, but it’s only once a year! 13. What’s Old – Fringe! Yuck! There’s still fringe out there, and this has to go according to the students, they get tangled and are hard to work with. This reminds of us a of a tangled mess. Fringe streamers and tons of curly tangled ribbons. Uh, No! Fringe is old. The use of curly streamers is fun IF done to accent the ribbons and not BE the ribbons. Plus you don’t want to pay $100 for Mylar ribbon that costs .99 cents a spool either. Thank you for your thoughts Kendall. 12. What’s Hot– Signature Colors! Usually or should we say “traditionally” The mum colors are school colors. They show school spirit and it’s technically for a school function, but the trend in 2018 is YOUR SIGNATURE COLORS. You know, the ones you love the most. Whether they be pink and white, purple and black, tiger print etc. Using your own colors are hot in 2018. Step out of the norm and choose the colors YOU like. Will you stand out at school YES! Will anyone else have your mum? Not likely. Don’t be afraid to be true to you! 11. What’s Hot – Adjustable Garters! For years garters have been a stretchy “one size fits all”. but the hot thing in homecoming garters for 2018 is adjustable garters. They are either tie-able or they have Velcro or snaps to adjust to various arm sizes. This helps a lot as your teen gets buffer! Those arms grow and the Garters should be able to adjust to fit them without falling or squeezing them all day. This is a special request you’ll have to ask for from your mum maker, it’s not a given but most custom mum makers now can do this upon request. Big Mega garters are gaining popularity. We know the guys don’t seem to care about mums as much as the girls, but suprisingly, more orders are perfected by the male student making the order than their own mothers! Over the years we’ve found the boys know what they’re looking for half the time without help and when they call to make their orders they want their garter to be just as big as hers and want his to be up to par with hers every time! It’s all about the Custom Homecoming Garters! And why not? guys like to be uniquely cool too! Watch for the guys garters to grow in size this year! 9. What’s Old – Lengthy Mums! You’ve seen them. Those mums that are just way too long. making the poor short girls trip over them. Most mums are between 30 and 36 inches long. Well let’s think about this. If you’re 5 foot tall. the ribbons alone are 3 foot long, couple that with a foot to a foot and a half mum head and stick it to your chest and try not to trip all day long! Attention short girls, don’t be afraid to tell your mum designer to make it shorter for you. Your mum doesn’t HAVE to be a standard 36 inches (3 feet). You don’t have to trip all day, and we don’t blame you. Just kindly tell your mum designer to make your mum an easy 24-30 inches and on your height it will hit you in the same place the tall girls wear them and no one will be the wiser! 8. 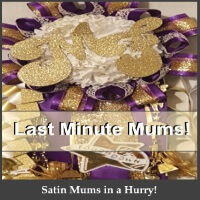 What’s Hot – Luxury Keepsake Mums! For years mums have been plastic and sort of wear and toss. Now more than ever they have turned into a product that lasts years after graduation. By upgrading to more of a luxury product, it makes the mum go from toss to keepsake. Higher quality supplies, coupled with a seasoned professional designer, makes these mums a true memory keepsake. They have started to be used in other aspects as well, by taking piece of your high school senior homecoming mum and placing it into your baby mum upon a first child years later, traditions are born and carried over and we’re seeing more and more requests for this in 2018! 7. 2018 Trend – Timeless and Classic Mums. Timeless and classic mums are trending hard in 2018. We saw more and more students asking for large mums with a thick classic design. This is a classic upscale mum that is hard to date in photos for years to come. We know when parents are careful not to add a “right now” theme or other elements that would show the date of the mum later on. Think of the photos of the ’80’s we all know the decade from those high bangs we all had, it’s the same concept. To keep from showing the era, or the time, classic designs have been something we’ve seen requested more and more. Just.. No. This is one trend that needs to die quickly. We never understood the use of this ribbon. After spending so much time and thought on the design you want, then throwing down $100+ on it, just to throw a laser looking ribbon in the mix. WHY?! It makes your mum look cheap. Here we go, The Top 5! 5. What’s Hot – Digital Tech! What? Digital tech is in our hands most every minute of every day. We walk around with tablets and phones like they’re surgically attached, especially students, so why wouldn’t they want a little tech into their mums? How about a digital photo frame? Or a musical song singing mum? Sounds strange? Nah, it’s hot to add tech, but too much tech, is a bad thing but one main piece is what’s hot. 4. 2018 Trend – The Details! What we mean is that the details, really do matter. It’s what makes your homecoming mum unique. A mum designer that pays attention to the details is a keeper! You can really tell when there is thought put into your design and one that is really just thrown together. The details you can think to add will result in a truly custom homecoming mum and will make your creation stand out from everyone else’s. The details in a mum scream high quality! Use those special touches, they really mean a lot and change a mum from something you wear, to a keepsake! You know what we mean, those plain store bought, couple trinkets, school colors. Can you say yawn? Parents, please don’t let your kid sport these. Yes they’re cheaper we know, but there’s a reason for that and these type of mums don’t do your kids any favors with their friends. As parents we want our kids to look cool, not just in their senior year, but all the way through! Homecoming mums are THAT important to your teen, (especially to your teen girl) and that being said, you’re also carrying on the tradition. Don’t slack! 2. What’s Hot – Hidden Gems! Hidden gems are the best! These are little special additions that a mum maker will add to the mum, sometimes at the parents request, sometimes because they know the student etc, what ever the reason they’re hot! Hidden gems can be anything from a necklace locket with photos in it, or a brag ribbon with a special shout out on the back to a charm, or special ribbon for a charity you support. There’s millions of hidden things you can think of to make your mum extra special, by hiding a few things with real meaning to the student lost a loved one and would love to see that a tiny angel trinket is hidden in the mum. These special Hidden Gems can make all the difference in the fond memory the mum is for years to come. A popular trend in private schools! More and more private schools ask for strands to be left open so that they may add their favorite locket, memorable charm as a gift. We think that’s super sweet! Last but not least, drum roll please.. The 2018 hottest trend of the year is The Mega Single Mums. These megas are a win-win. Not only are they are huge 10″ flower but the time to produce a Mega Single is a lot less , and parents love it because so is the cost. These Mega Singles won’t run you $350-450. They’re more like $200-$275 price range. The students love them because there’s plenty of room to sport all their favorite additions on and they’re easier to handle and wear. They also are universal to 9th to 12th grades, and parents and students like that a lot. Heads up, most craft stores won’t sell supplies for flowers this huge, so contact your favorite mum maker and see about one of these mega singles. Most custom mum makers love a challenge and it excites them to be creative and offer more. Don’t be afraid to look up your favorite Mum Maker and let them create your best homecoming look. Make sure you’re getting your money’s worth and compare what you’d spend in supplies verses what it costs to have one made. And moms… don’t feel guilty for not making it, that’s not a tradition, having a beautiful keepsake gifted mum, is. Do you sell wholesale ? 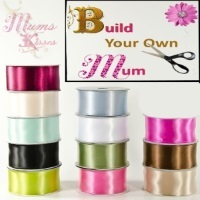 Or do you just custom make Mum’s. Do you sell trinkets & ribbon ?? We sell our custom homecoming supplies in our Crowley TX retail location, the ones that we use in our own mums. We also sell a few trinkets but not many, our thing is custom hard to find items and we custom make mums too. We do not do wholesale supplies and we do not sell our supplies online at this time, only in our retail location. I love your stuff! Your store is super cute! I was wondering if you are going to have more items soon?